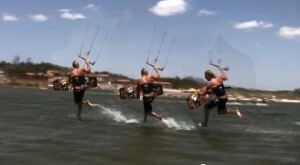 Jesus Style or Jesus Walk, the trick’s name catches your attention, well, we all know kiting is the sport of the gods so are you surprised? Perhaps after doing the trick successfully, you can now turn water into wine. 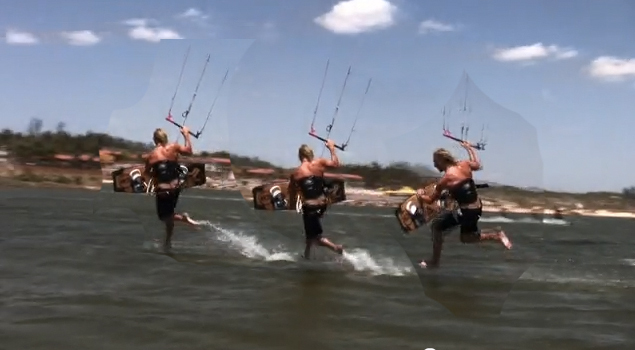 Jesus Walk trick is the kiteboarding equivalent to the “Christ Air” in Skateboarding. Darkslide trick, being a pre-step to another cutting edge kitesurfing trick that is to be discussed here, must be performed smoothly before any Jesus Walk attempt. Darkslide and Jesus Walk are all about Hangtime, but instead of Boost it is almost a hangtime, like a walk above the water. Ponder on you first attempt to Boost that you just could not get the right height and you simply looked like doing the basics of just swinging under your kite. Well that is just exactly what you are attempting to do with a Darkslide or Jesus Walk. A lot of kitesurfers have not done this latest tricks yet, never have even attempted in mind because of its timing difficulty. Others would tend to ride with their feet locked in so tight that there’s no way they could get the board on and off so easily. Practice makes perfect because quitters do not win and winners do not quit. What’s the common question a sport enthusiast would ask of this trick? “Do you let your kite loop at the end,or catch it before it loops back to the left and fly it normally?” The answer is actually shown in the actual videos I have provided in this page. Since this is a newly developed trick, I will not go into further details but the keystones and tips for you to consider if you will try to do it first time. 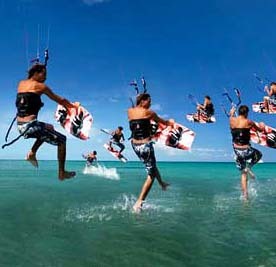 Let experiences of kitesurfers speak for the trick. The video likewise has so much to say about this particular trick. Jesus Walk trick does not work underpowered or too over-powered, so make sure just to have enough power in your kite just before the zenith. Ride with your normal speed. Steer your kite slowly from left to right. Instead of steering the kite back before landing, you pull harder to the right. Pop off the water and grab your board while holding down the bar to stay in the air. Do as many steps in the water as possible while you steer the kite slowly over the zenith. Get back into the straps, but meanwhile keep pulling the kite hard to make it loop, so you get some extra airtime. Land and keep riding. Doing a kiteloop instead of a transition makes it easier. For a transition, the timing has to be perfect. Less perfect with a kiteloop gives you a bit more time to get back into the straps. The landing will be faster though. Steer the kite to 11 o clock, then pop off the water, while you pull off the board. Slowly steer the kite back to 1 o clock position while you run over the water. When the kite reaches 1, do the kiteloop. Then put your board back on and land. To add more power in the kite to stay up in the air, pull the bar in so the kite loops. You need space; with someone close by you cannot loop the kite. Be quick with putting that board back on to concentrate on the landing. This entry was posted on February 13, 2012. It was filed under Intermediate and was tagged with Jesus Walk.